NuMedica Methyl Folate Optimizer is designed with the most active form of biologically active folate to support the cardiovascular system, nervous system, and homocysteine metabolism. This powerful methyl folate supplement provides therapeutic levels of activated folate; activation means that the body does not need to convert it for use in the body. Instead, it's ready to get to work and provide optimum support for essential systems of your body. 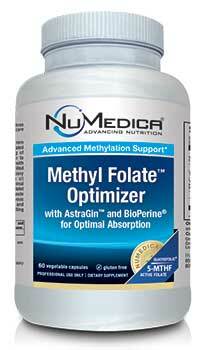 Methyl Folate Optimizer is a comprehensive formula designed to support optimal methylation and homocysteine levels. This formula supports methylation on two levels: first, it enhances absorption in the intestines; second, it provides the form of folate requiring no additional metabolic steps by the body to be utilized. Other Ingredients: MCC (microcrystalline cellulose), rice flour, HPMC (vegetable capsule), ascorbyl palmitate, silica. 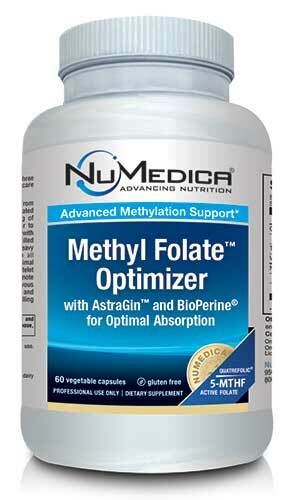 †As Quatrefolic® 5-MTHF. Quatrefolic® is trademarked by Gnosis S.p.A. Patent No. 7,947,662. BioPerine® is a registered trademark of Sabinsa Corp. AstraGin® is a registered trademark of NuLiv Science.